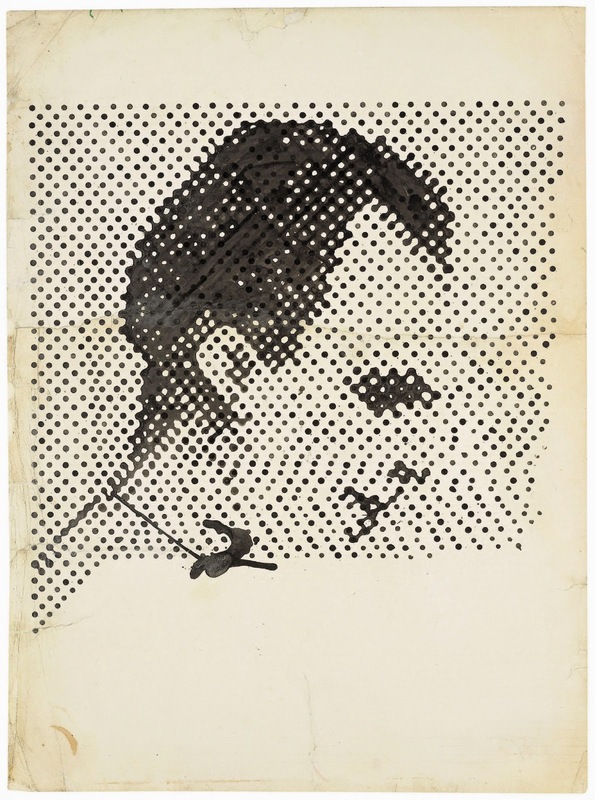 Sigmar Polke was an artistic chameleon, moving from one medium to another, one style of painting to the next, this sphere of public discourse to that one. Organized by MOMA with the Tate Modern (London), this show is a type at which they can excel—guided not by a blockbuster or blatantly populist sensibility, but with an eye toward revealing the many layers of an important contemporary artist's work. MOMA's survey, Alibis: Sigmar Polke 1963-2010, demonstrates how extensive and deeply rooted his influence has been. Polke (1941—2010), German, had a wry, satirical streak. Early works include a painting of a cabinet indicated by one vertical line surrounded by two dots. He also recorded things in the news, such as a seemingly incomplete raster (benday dot) drawing of Lee Harvey Oswald—an incomplete, distorted portrait of an enigma—as well as banal objects, such as socks, sausages, biscuits, and shirts, which connect to Pop Art. His eye for pattern was expressed in dot paintings, as well as compositions using patterned or textured fabric as a canvas. 5 Dots (1964) depicts five blobs on a calico background; one of the green dots with a tail becomes a balloon, immediately conjuring a sentimental context amid a pleasing abstraction. He absorbed influences, and no doubt emitted his own that were refracted in the work of others. His rasterized pieces summon Roy Lichtenstein; his dots, Damien Hirst. He cited Cezanne, Gilbert & George, and Malevich—hilariously, as in Higher Beings Commanded: Paint the Upper-Right Corner Black! (1969). His self-reflection materialized in studies of himself as an astronaut, a test-tube drug, and in a mock-serious diptych, glamorous lurex portraits of his palm's lines as read by a fortune teller. He connected to Fluxus with inventive elastic band rendering of a bunny; a folding-ruler composition; and in Carboardology (1968—69), an oddly riveting index of cardboard samples. His identity as a German found its way into his work with regularity; swastikas and military symbols recur. Potato House (1967) combines two national icons—the root vegetable and the garden shed. In this chronological installation, double-exposed photographs of mushrooms share the year 1972 with Mao, an absorbing painting representative of his complicated technique of layering multiple images, perspectives, and subjects. 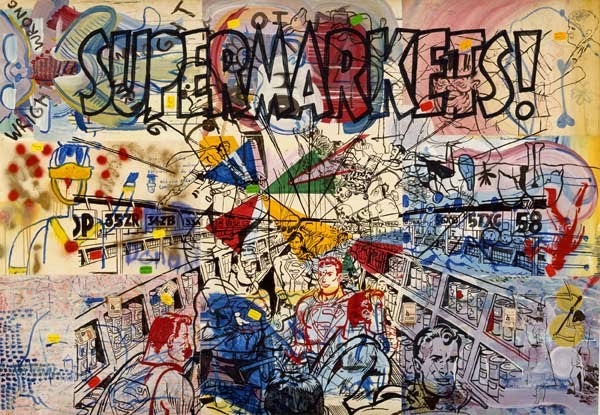 Supermarkets (1976) is a prime example of his major paintings—a complex 2D layer cake of an army of Supermen clones painted atop a jammed supermarket aisle, supported by cartoon and graffiti-like characters. He would also sew several types of fabric together—canvas, sunglass-and-deck-chair-print, and pink quilting—to form a canvas, onto which he layered freighted imagery, as in Watchtower with Geese (1987). Videos and sculptures mix in with the two-dimensional pieces. Sketchbooks and multiples show his concept and color experimentation. And his later work, such as The Young Acrobat (2000) shows a curiosity for producing intentional technical flubs—stretching or contorting an image—thereby subtly twisting the narrative context and subverting the predictable reliability of technology. The soaring atrium serves as the starting point for the 10-gallery installation; it's a fitting entree to the output of a vast imagination. On view through August 3.